Friday Sept 30h, 2016 through Monday Oct 3rd, the world’s foremost experts in NADA YOGA and the art of Sacred Sound will come together to immerse retreat participants in the power & awareness of subtle frequencies. This four day intensive program is ideal for Yogis and sound healers wanting to deepen their personal practice, yoga teachers who want to integrate sound with their classes, and for sound healers working with yoga teachers to enhance and deepen the yoga/sound healing experience. You will practice and free your voice with the “Yoga Of The Voice”, presented by worldly renown teacher and Grammy Nominee Silvia Nakkach director of “The Vox Mundi School Of The Voice” and faculty at the California Institute of Integral Studies. Laraaji Nadananda & Arji Oceananda will lead us into a deep Listening & Laughter meditation. This playful interactive experience consists of call & response chanting, playful laughter-therapy exercises, deep relaxation component sonically supported with celestial music and sound, and a healing, meditation upon the inner nadam… sound current. Lea & Philippe Garnier directors of the Sage Academy Of Sound Energy will share their practices on how to incorporate sacred sound into a yoga class setting, the asanas of sound. Grammy winner and Bansuri Master Steve Gorn, an innovator in the field of contemporary world music will also join us as a guest presenter. This transformative retreat is a 4 day immersion into the Yoga Of Sound. Brahmanada, the cosmic sound, the primal vibration, the divine, ever present creative sound. Union through sacred sound. This retreat is appropriate for all levels of yogis and will address the needs of both the yoga teacher interested in incorporating sound with their classes and yoga practitioners interested in using sound practices for their own healing. Given the caliber of excellence associated with the teachers at this retreat you will receive the theoretical and practical information needed to incorporate nada yoga/sound healing into your desired modality. EXPANDING OUR YOGIC CONSCIOUSNESS THROUGH THE AWARENESS OF SACRED SOUND. The manifestation of this retreat is the result of having Sage Center nested on top of a yoga studio and the natural integration and sharing of the knowledge of NADA YOGA’S healing benefits for Yoga teachers and Yoga students alike. The study of Sacred Sound, is one of the best tools available today to achieve a better understanding of the world around us, and to expand our Asana based-yoga practice to another level, which can help to create an even more peaceful attitude in our lives, thus feeling happier and complete. 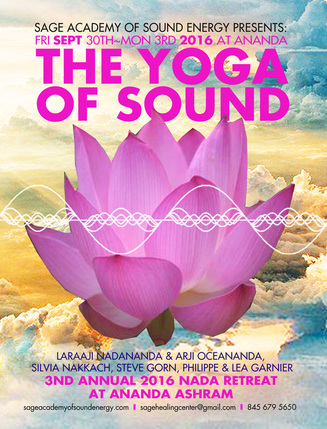 Experience and learn about the awareness of sound consciousness, Nada Yoga and Sound Healing. Frequencies surround us; without and within. Learn to incorporate healing frequencies within your classes and personal practices. This course will specifically be of interest to yoga practitioners who want to deepen their practice using sound as a platform to get to the Anahata space of being, in wholeness. The YOGA OF SOUND retreat is about reuniting yoga students and teachers alike to the experience and understanding of sacred sound in the tradition and science of Nada and Bhakti Yoga. By using Sacred Sound as a tool for the expansion of consciousness, yogis have the opportunity to connect better to their higher purpose within their community as well as gaining first hand knowledge on what effects sound has on the body and the amazing benefits of its healing powers. For the past 5-10 years Sound Healing has undergone a period of re-discovery and is now poised to reveal the intricacies of healing at both the cellular and psychological levels. Those who seek personal transformation through the miracle of sound will also find this to be an incredibly empowering and enriching experience. Thanks to the vastly growing numbers of sound practitioners, it is fast regaining its place as the pre-eminent healing modality. Sacred Sound awareness is now bridging all yoga communities and is being introduced more frequently into everyday Yoga practices.